Dentist Frederick, MD | Are You at Risk for Hairy Tongue? Dentist Frederick | Are You at Risk for Hairy Tongue? You may not realize it, but you could be at risk of developing an unsightly medical condition known as hairy tongue. While it is harmless in most cases, hairy tongue is still an unpleasant ailment. 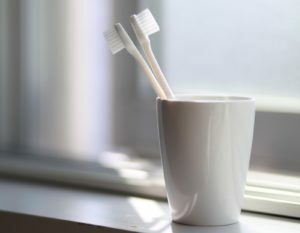 The causes are not always completely known, but practicing good oral hygiene at home and visiting our dental office for cleanings can help prevent the issue. Here’s what you need to know. With hairy tongue, your tongue may look like its covered in fuzz or hair, but this condition is actually caused by an accumulation of bacteria. The surface of your tongue is covered in small, rough papillae which gives it its rough texture. Overtime, these papillae grow, shed, and are replaced. Occasionally, the older papillae may fail to shed properly. This causes a buildup on the tongue and can cause a hair-like appearance. Who is at risk of hairy tongue? According to the American Academy of Oral Medicine, as much as 13% of the population may have hairy tongue. Anyone can develop the condition, but certain risk factors such as age and tobacco use increase your chances. While the exact causes of hairy tongue are not known, there are a variety of factors that can put you at a higher risk of developing the condition. Poor oral hygiene and a diet of soft foods can put you at an increased risk, as a lack of stimulation on the tongue can prevent the shedding of older papillae. Excessive consumption of certain substances, including tobacco, alcohol, coffee, and tea have been shown to contribute to this condition. Dehydration and dry mouth can slow down the tongue’s natural refresh cycle of replacing papillae. The best defense against hairy tongue is a regular at-home oral hygiene routine that includes twice daily brushing, flossing, and mouthwash. Visiting our practice at least twice a year for cleanings can also give us an opportunity to regularly examine your mouth and catch any early signs of hairy tongue. If you’re past due for your regular cleaning or are concerned that you might be developing hairy tongue, don’t hesitate to contact our practice for an appointment today.